It is nice to be able to walk to the hills from your accommodation. 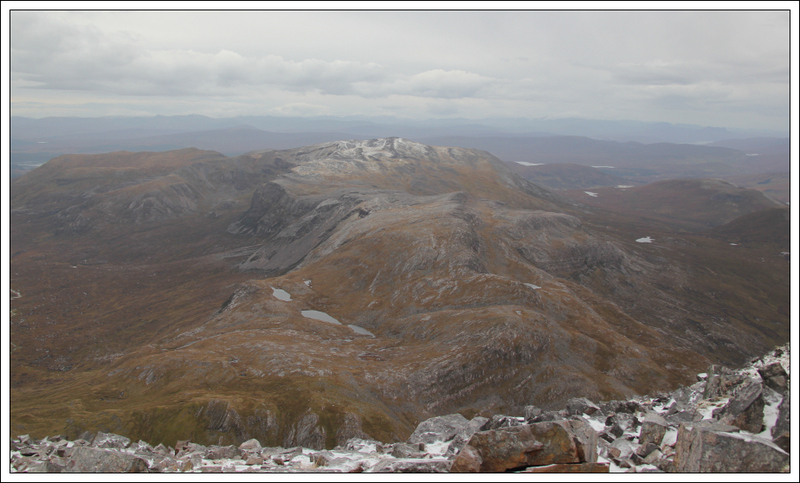 This was the case yesterday morning when I set off to ascend Conival and Ben More Assynt from Inchadamph Lodge hostel. 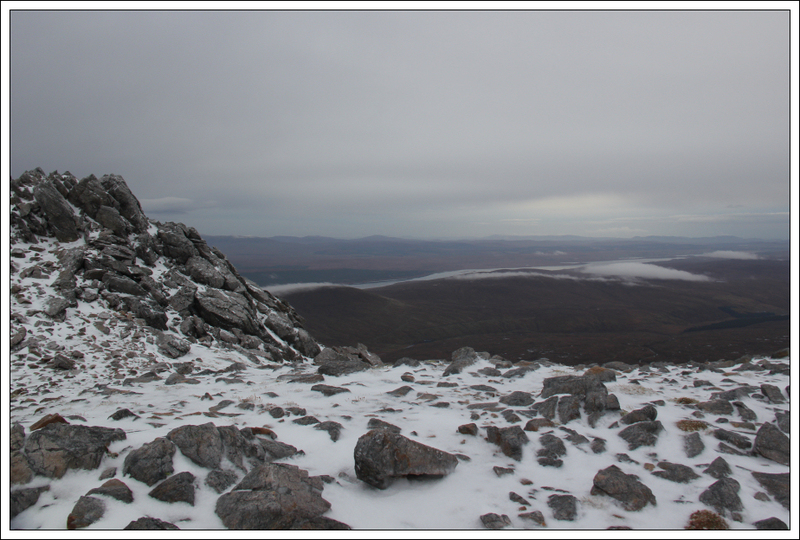 According to Friday’s North-West Highlands MWIS forecast the weather was supposed to deteriorate late in the afternoon. I therefore decided to head off reasonably early a) to take advantage of the limited daylight and b) to get back before the weather started to take a turn for the worse. I set off sufficiently early to miss the revised Saturday morning North-West Highlands MWIS forecast which apparently advised that the weather would be deteriorating sooner than had been originally forecast. Come on MWIS get it right! 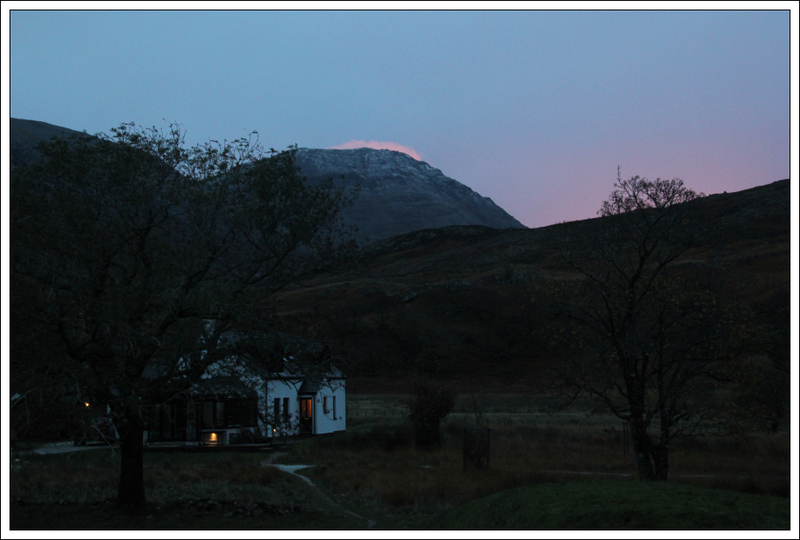 The morning sky was nice and red, so shepherds (and hillwalkers) be warned. I set off walking along the vehicle track leading to Glenbain. 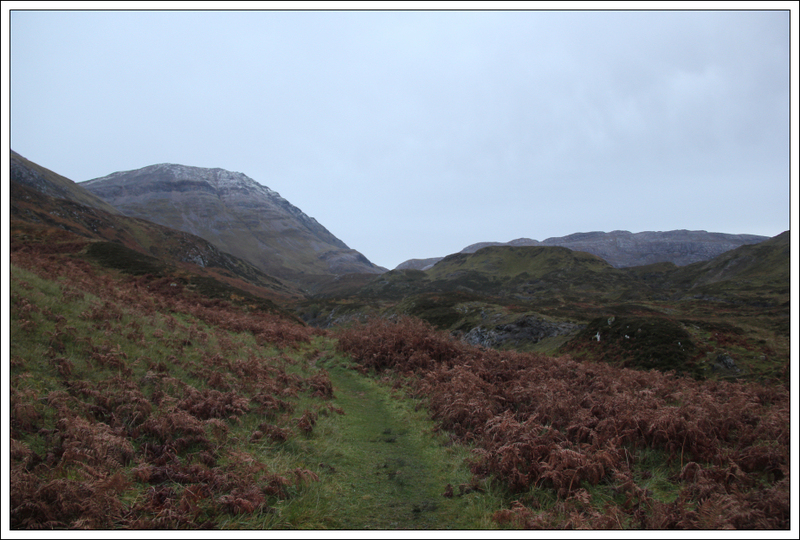 I last walked along this track to ascend Conival and Ben More Assynt in 2004. 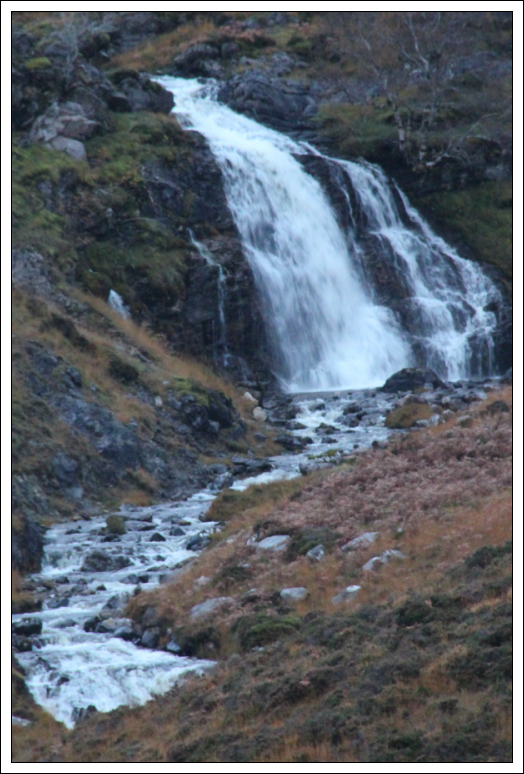 It didn’t take long to reach Glenbain where I stopped to take a photo of the Allt na Glaic Moire waterfall. The burn was in spate owing to the thunder and heavy rain the night previous. A short distance beyond Glenbain the vehicle track changed to a path which I followed for a further circa 2.5km to reach the base of Conival. 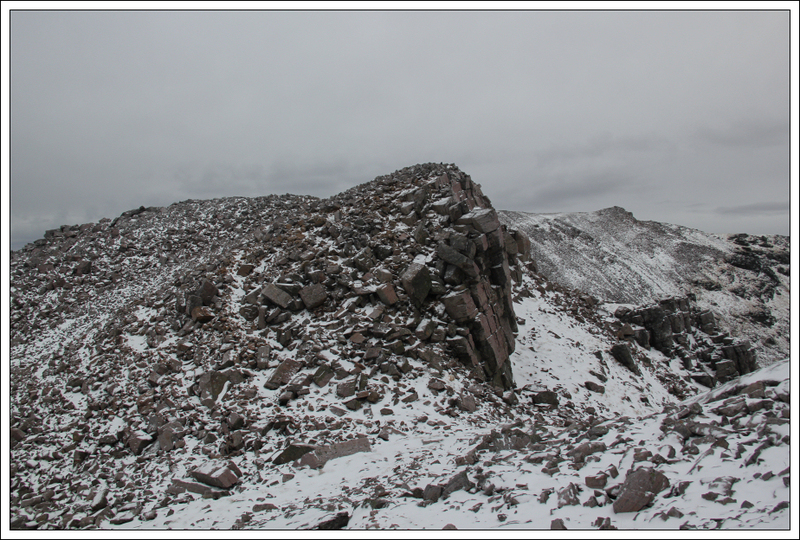 On approaching the base of Conival, I could see an eroded mess of a track leading up Conival. This track could really do with some repair work. As I gained more and more height the views become increasingly good. The weather was still really nice – a calm between two storms. Once above the short wall, the gradient eased and I had a short break before continuing on towards Conival. 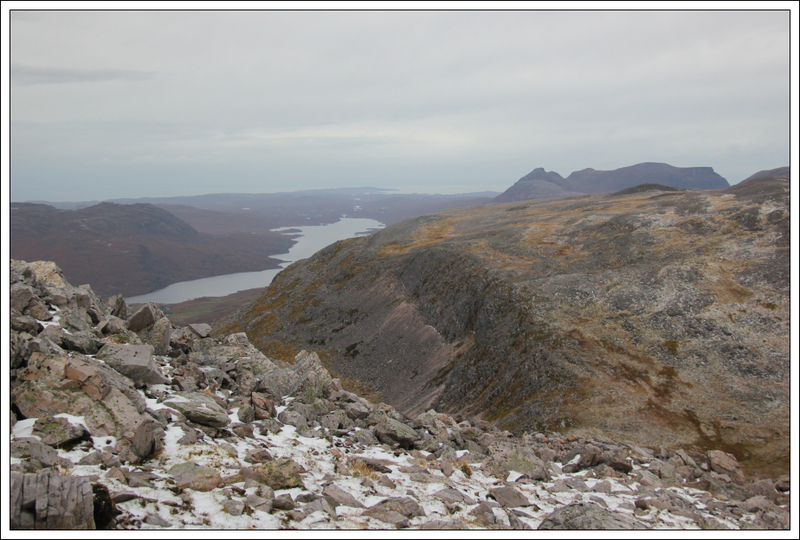 During the next section of ascent, Quinag came into view. It is a fantastic triple Corbett. 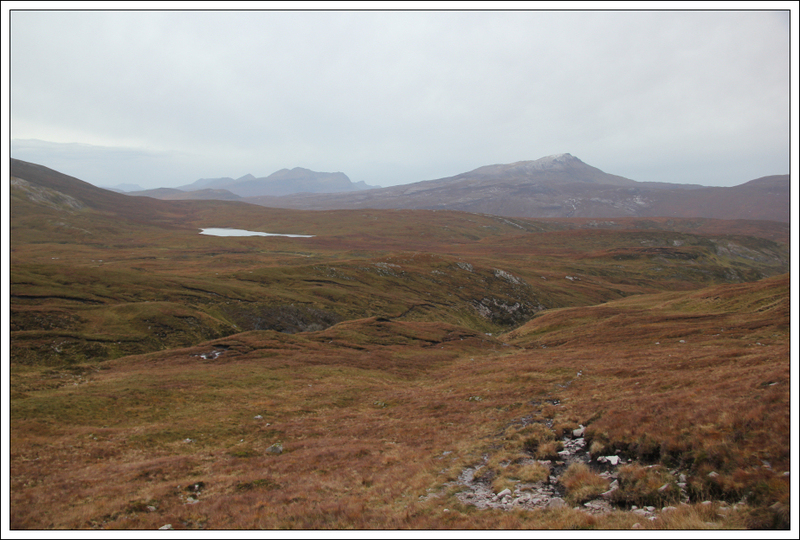 Suilven also started to make an appearance from behind Canisp. I was really impressed with the views during the ascent. It was worthwhile getting up and setting off early to get superb views across Coigach, Assynt and to the North towards Foinaven. Beinn an Fhuarain definitely caught my eye during the ascent. 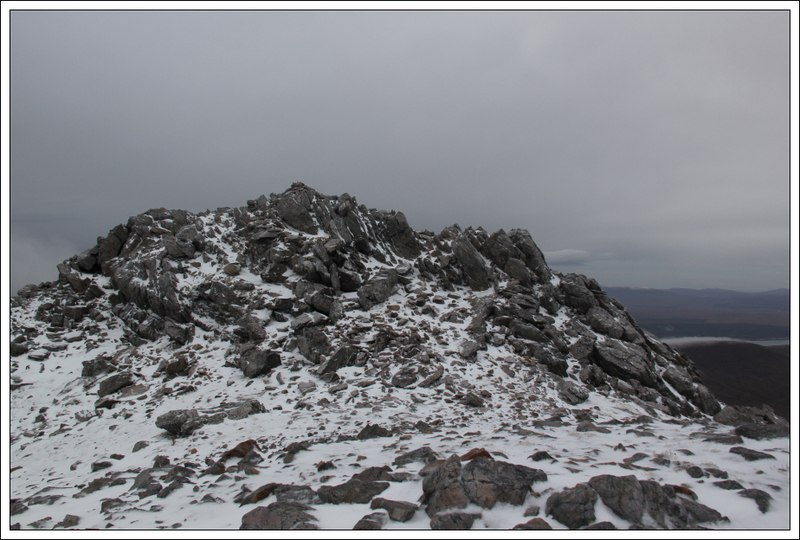 This looks a really nice hill with some impressive crags below its summit. 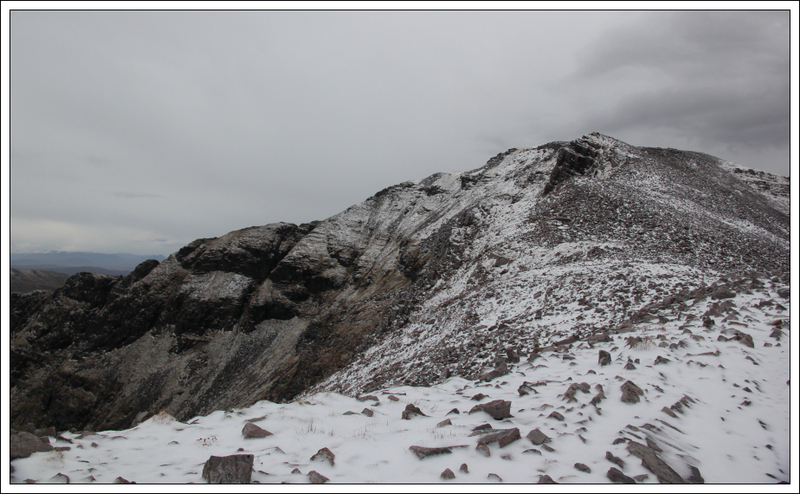 It wasn’t long before I was above the snow-line. 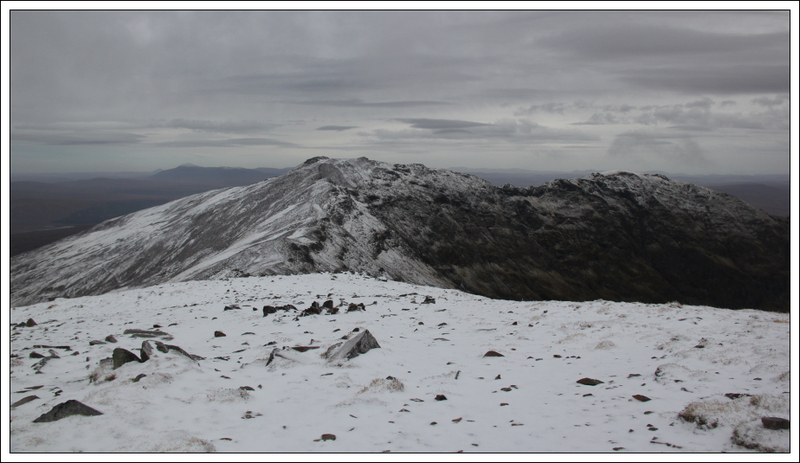 This dusting of fresh snow extended along the ridge from Conival out to Ben More Assynt. The ascent was a bit slippery here and there as I was wearing my three-season boots which have fairly-worn soles. 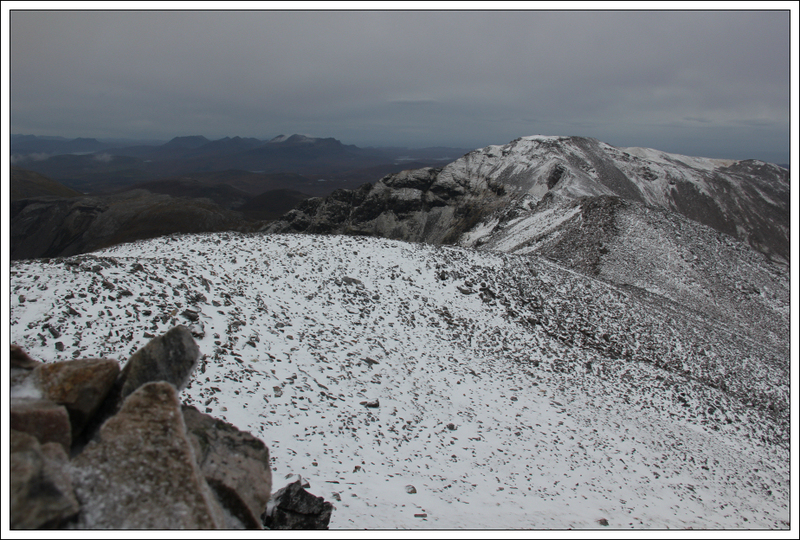 On reaching the summit shelter, I decided to put on my crampons for the continuation out to Ben More Assynt. The snow wasn’t hard so I arguably didn’t need to use them. However, given I had carried them up there, there was no harm in using them to allow me to progress more quickly along the ridge. The walk along the ridge was fairly pleasant albeit there were a couple of sections where it was very windy. 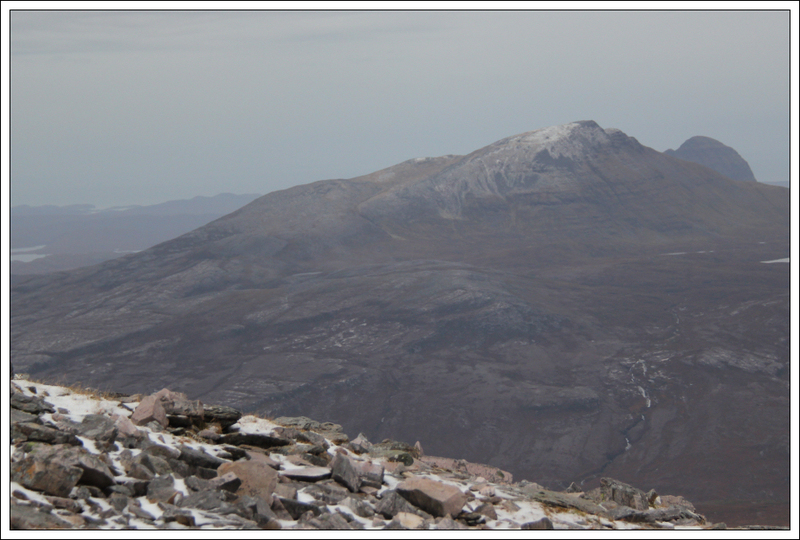 As I approached the summit of Ben More Assynt, I wasn’t sure which of the two tops was highest. 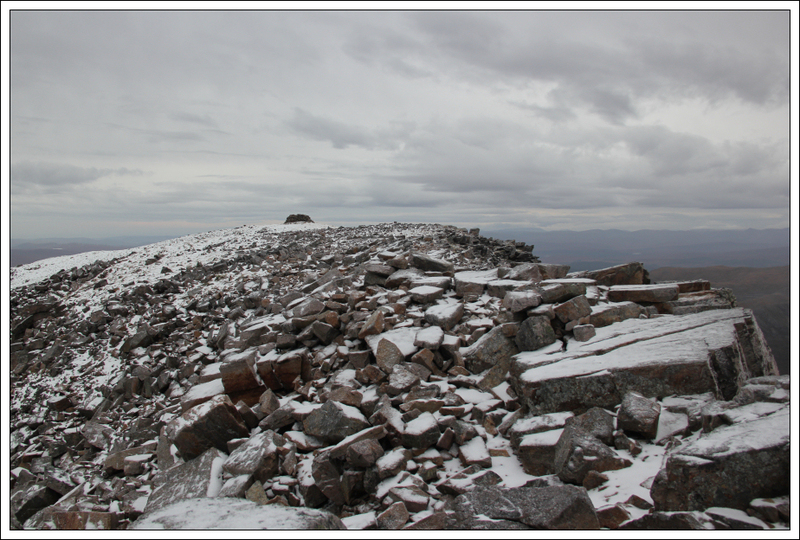 I visited what turned out to be the summit top first but also visited the other top before returning back along the ridge. It was originally my intention to also head out to the South Top. However, I could tell that the weather was changing earlier than forecast. The wind was picking up and clag started to shroud the hill. 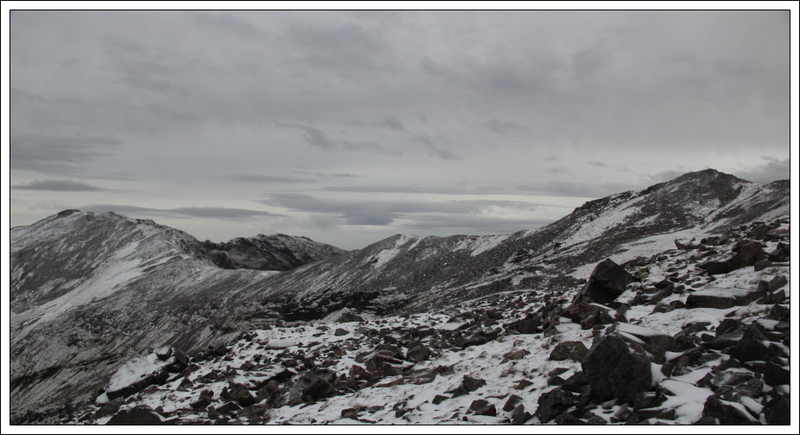 I therefore decided to head back along the ridge towards Conival. 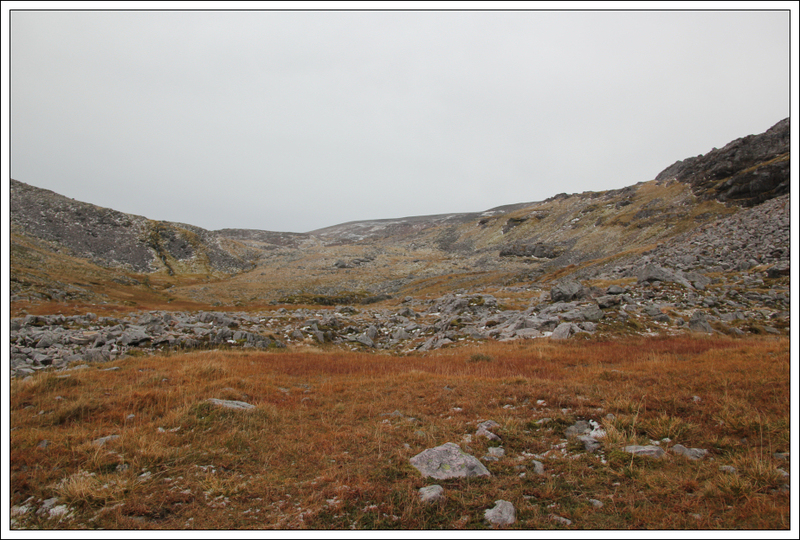 I didn’t take any photos during the return as the visibility had decreased substantially and I had taken plenty of photos during the ascent. Circa half-way along the ridge between Ben More Assynt and Conival, I met Mark, Ali and Sheena who had set off circa 45 minutes after myself. On reaching the summit of Conival I also met Graeme, Joe, Fiona, Drummond, Ella, Alan, Jane and Carol who were taking shelter in the shelter and in two bothy bags. 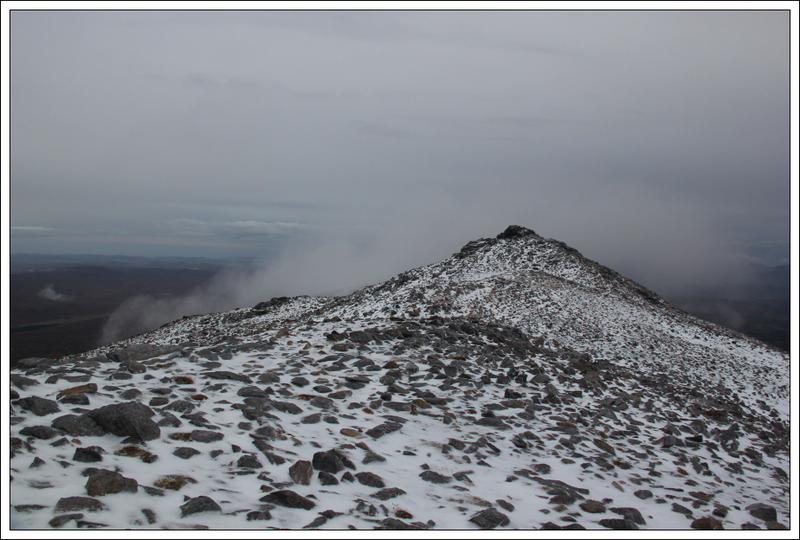 By now, the wind was getting significantly stronger and with the windchill it was fairly Baltic! Ella and Fiona joined myself on the return from Conival summit back to Inchnadamph. The descent was fairly unpleasant given the strength of the wind. 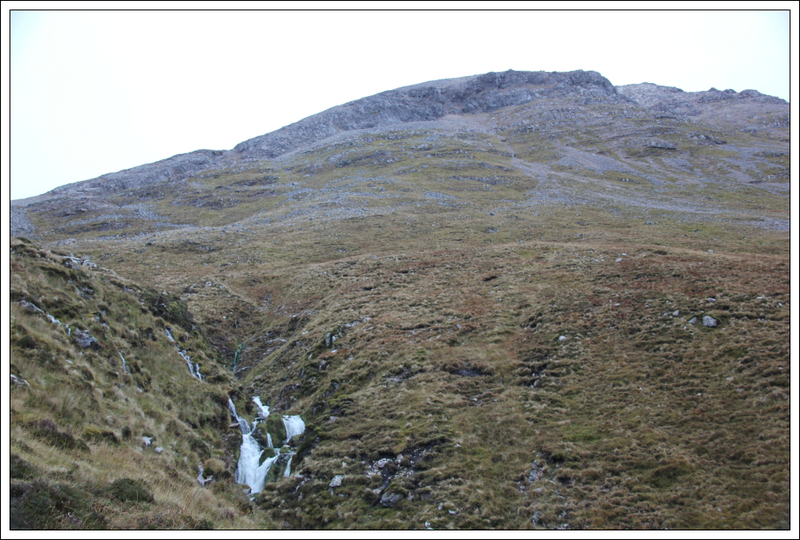 On reaching the River Traligill, at the base of Conival, we stopped for a bite to eat before continuing back out to Inchnadamph. 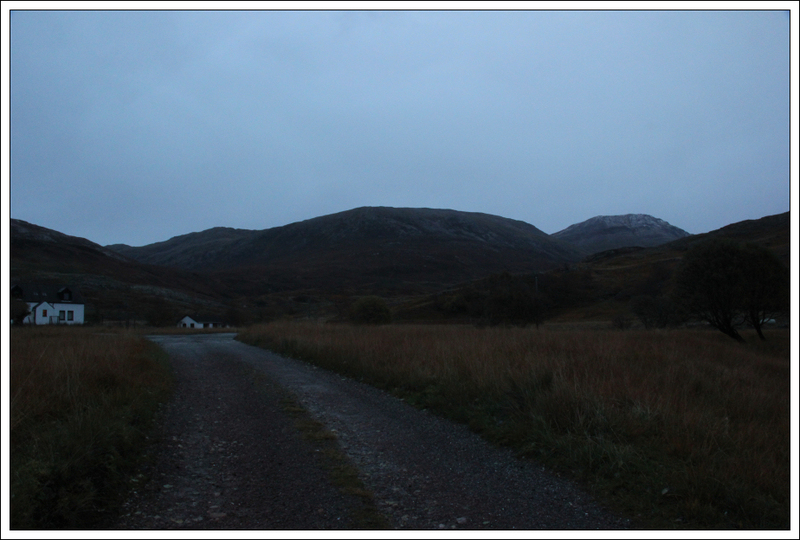 During the walk out we encountered heavy rain which persisted throughout the afternoon and evening. Nice to visit these hills again . 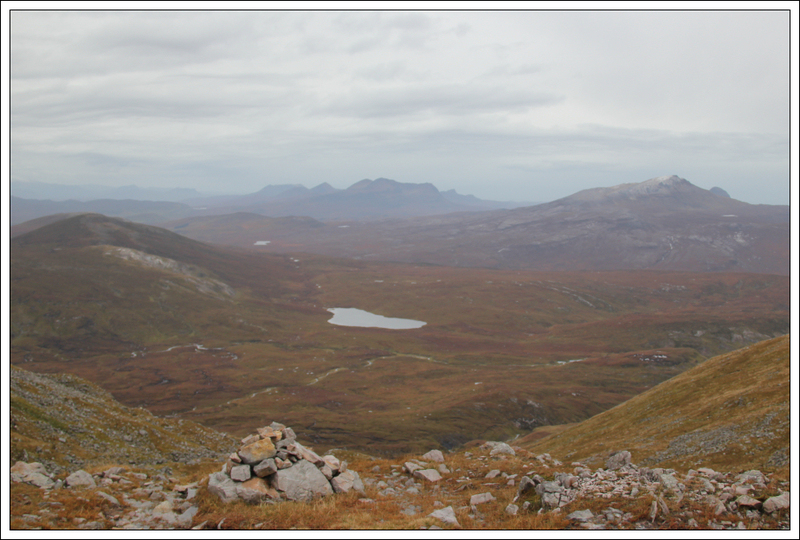 Always happy to see pics of Assynt. Really need to revisit that pairing. Attempted them in cloud on another windy day where the woman in front of me on the ridge between the two repeatedly got blown over. The wind didn't efeat me but sadly cramp did and I had to leave BMA for another time. What like is the hostel there? The hostel is excellent - it is an independent one. Lots of space inside - good kitchen, dining area and lounge. Owner is really friendly too. I'll second that, although i've never used it but Jimmy and Mo have and they're hard to please. It's a great ridge between those two mountains, fc. 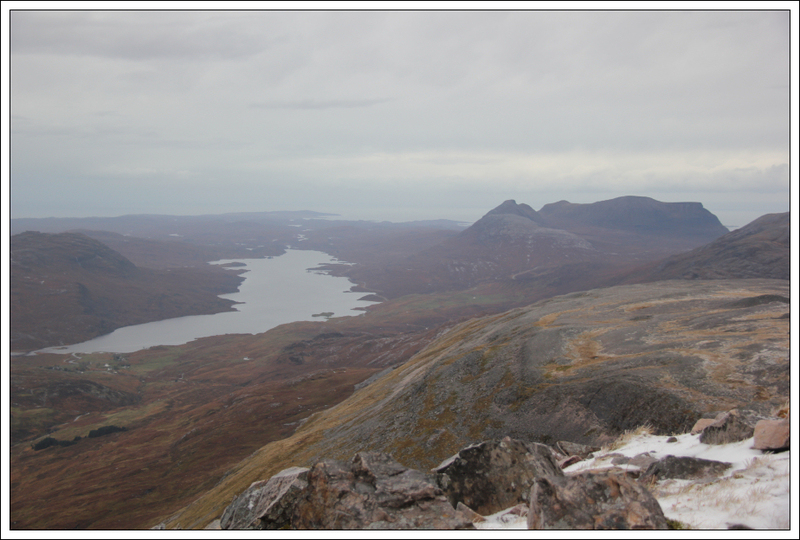 I like the pictures with just a bit of snow on the tops, and you got some nice views of the lower Assynt peaks. That's a route you really can enjoy when going there and back the same way. I did these a couple of months ago and while the weather may have been nicer, I prefer the hills when they have a covering of snow on them, especially when looking back at the photies. Also I'm sure you wouldn't have been eaten alive on the long walk back. 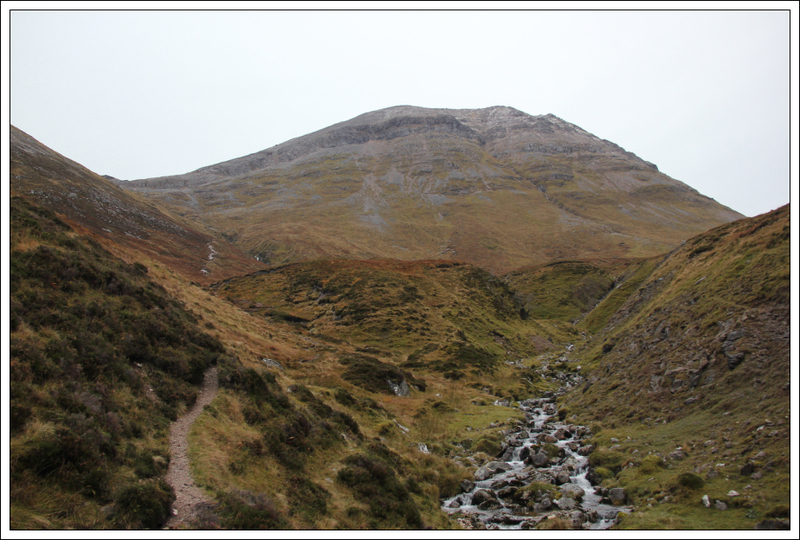 My fave Munros so far though, lovely views up there. foggieclimber wrote: Beinn an Fhuarain definitely caught my eye during the ascent. 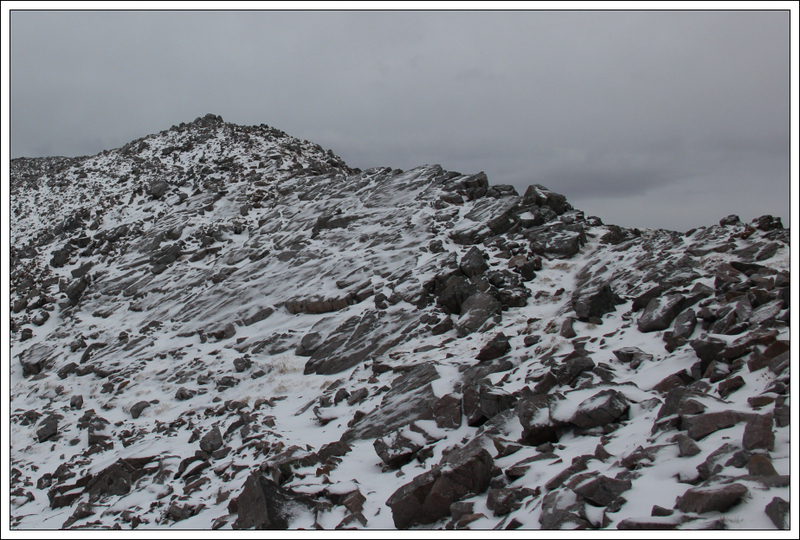 This looks a really nice hill with some impressive crags below its summit. 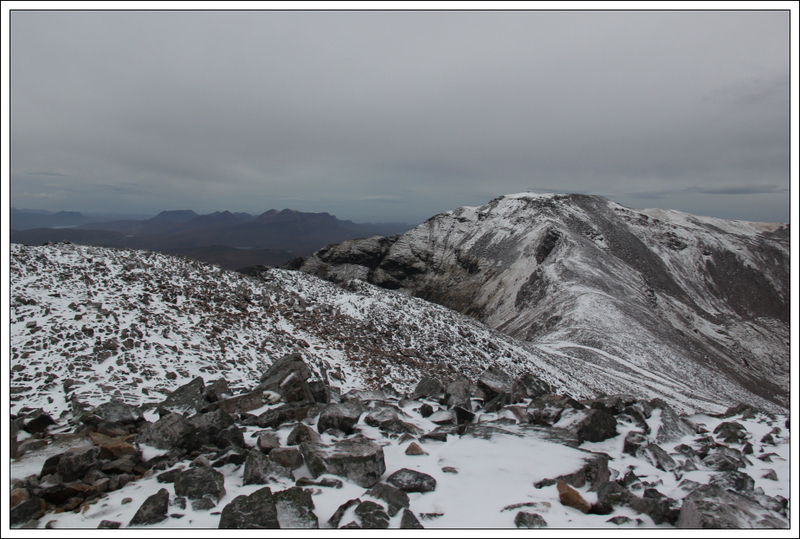 Did a traverse of Beinn Uidhe and Beinn an Fhuarain a couple of weeks back. 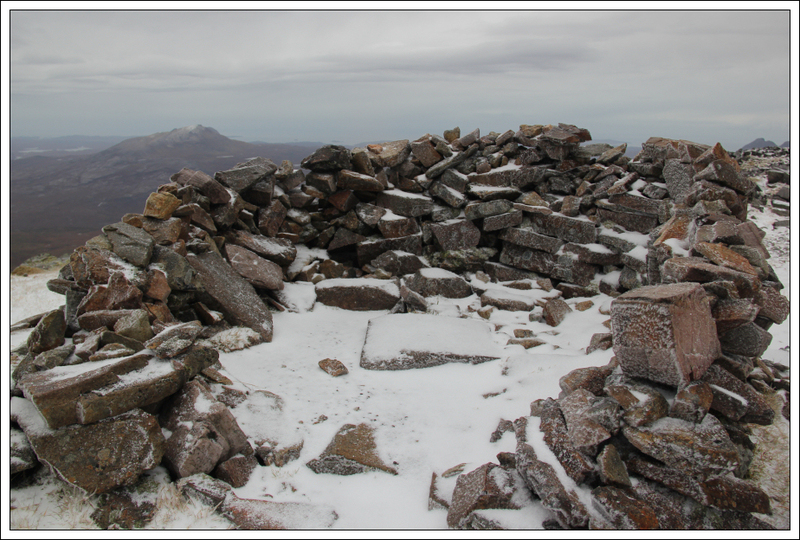 Beinn an Fhuarain is indeed an interesting hill, with an impressive escarpment on the east side and the summit cairn perched right on the edge. It would make a worthwhile detour on the return from Conival, with the option of visiting the new memorial at the 1941 air crash site and descending via the stalkers path from Loch nan Cuaran. 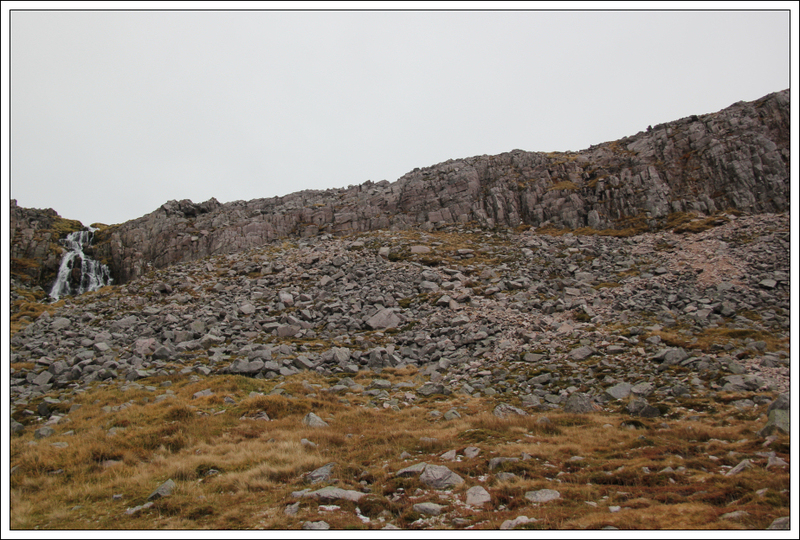 Beinn Uidhe is another matter, however: seriously tough going over endless quartzite boulders without any trace of a path! 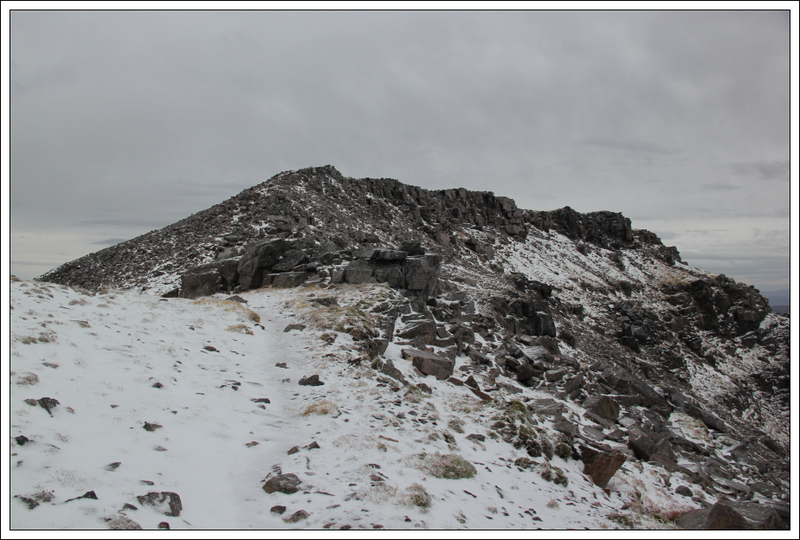 Looking a wee bit different from when I was up in July!